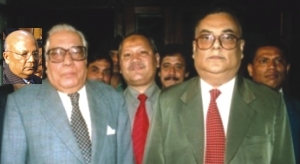 Chief Election Commissioner (CEC) MA Aziz has so far outlived nine lives. After his nomination as the CEC, he stood against the opinions of two fellow commissioners and went on with the making of a new voter list. At that time Aziz had managed to avoid calling any meeting of the Election Commission (EC) by what many believe, feigning illness. The CEC's so-called illness has reached the status of a myth: no sooner had the government appointed two new commissioners, who like Aziz, are also BNP-faithful, than Aziz found his feet back, and called a meeting of the commission. He, along with two BNP-backed stooge-commissioners, has so far been enacting one new farce after another. It has taken a Supreme Court verdict to make the trio scrap the enumeration. The judgement should have come as a giant slap in the face of the CEC, but beleaguered Aziz has refused to consider it a smack. "To err is human," he has said while defending a move that has cost his poor country 600 (Aziz says its 90) million taka. If the CEC has any degree of self-respect left in him, he would have resigned immediately after the Supreme Court verdict. But the obstinate way in which he and his colleagues have been holding onto their posts, we have reasons to believe that they have ulterior motives behind this overzealous behaviour. Nothing it seems can deter these three persons from taking decisions that are going to harm our democratic process. It is a little less than tragic that this arrant Election Commission has got two individuals who belong to our otherwise acclaimed judiciary. That MA Aziz and Mahfuzur Rahman are actually two judges of our Supreme Court is itself unbelievable and quite difficult for us to digest. Aziz and Co must understand that (it is presumed that they already know it) sooner or later they have to go. National election is not, after all, an issue of a group of egotistical people's sly whims. Last week's incident of three teenage boys slitting throats of three of their friends of similar ages was really frightening, especially for parents of school-going children. The incident took place at a house in East Monipur. Badhon, a student of class-VII, returned home along with five of his friends to play computer games or watch movies. Since Badhan's parents used to be out the whole day and would not return before evening, Badhan would often invite his friends at his home. But this time he would have to pay a price for his hospitality. Jahan, Badhan's classmate, who was a regular at Badhan's place, along with Rajib and Masud, tied Badhan and two others, slit their throats and then took away cash, ornaments, and a CPU. 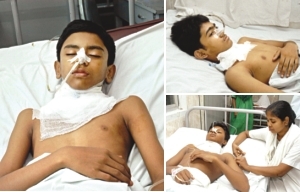 Badhan and two others are still nursing their injuries in a clinic and all the three teenage criminals have been caught. What is most disturbing how boys aged between 12 to 14 could almost murder three others. Juvenile crime is not a new phenomenon, but the degree to which their desperation stretched in this particular incident, is something that really boggles the mind. It is not just another crime, but a manifestation of some serious social ill that demands serious scrutiny. Even today, timeless numbers like 'Ekbar jete dei na amar chhotto shonar gayn', 'She je keno elo na', 'Ektara tui desher kotha bol re ebar bol', 'Aul Baul Laloner deshey' and many more fill one with a rush of warm feeling and the peaceful touch of melody. A warrior who had fought his way through the war of independence in 1971 with Shadhin Bangla Betaar Kendro, spreading his messages of confidence, condolence, love, the joy of victory and the agony of defeat, Anwar Parvez passed away last week. 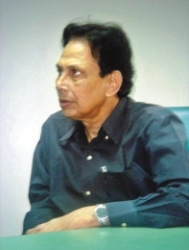 Anwar Parvez, one of the most brilliant music directors and composers of Bangladesh, died at the Heart Foundation Hospital in Dhaka on Friday after a prolonged ailment at the age of 65. He was suffering from prostrate cancer for a long time and was under treatment at the Holy Family Red Crescent Hospital. Later on, he was shifted to the National Heart Foundation hospital on Friday. Several cultural concerts and musical shows were organised to arrange funds for his treatment. However, nothing could stop Parvez from finally leaving his earthly abode and stepping into the other side of life. "I wish something more could be done for him," cried Parvez's wife, Jesmine Parvez. Cultural icons of the country such as Runa Lalia, Alamgir, Parve'z sister Shahnaz Rahmatullah and many more were present at the funeral. Parvez also left behind two daughters, a son and a host of friends and admirers. It is sure, however, that Parvez was a happy man during his last few days when the British Broadcasting Corporation (BBC) rated three of his patriotic songs in the 20 popular Bangla songs selected through a survey. A number that had created a revolution amongst the people of the country and instilled a fighting spirit amongst the freedom fighters is 'Joy Bangla Banglar Joy'. This used to be the opening and the closing song of the Shadhin Bangla Betar Kendro during the Liberation War. Composing this song at the age of 27 for the film 'Jai Bangla', the inspirational number kept the spirits high at the camps. "It was not that the song was composed for any particular party. It was rather composed at a time when people were united under a single banner for a common cause -- independence," said Parvez, in an earlier interview with The Daily Star. "When a composer works with a song, he has to depend on his basic instincts and his 'third eye'. His vision must not only focus on the context of the song, but also on the impact the song would have on the audience. So, when I was asked to compose a tune for the particular film, the first thing I visualised was the half-fed and half-clad people in distress, having lost all hope of livelihood, but still holding dear the hope of independence. And I wanted to create a tune that would re-kindle that hope into an engulfing flame." Abdul Jabbar and Parvez's illustrious sister Shahnaz Rahmatullah along with co-artistes lent their voices to the song. Shahnaz Rahmatulah had also sung Parvez' other famous patriotic compositions created after Independence, namely, 'Ekbar jete dena amaar chhotto shonar gayn' and 'Ektara tui desher kotha bol re ebar bol'. These numbers took over the hearts of millions in the country and abroad. Parvez was also one of the leading names in film music. He had composed songs for several Bangla films such as Abhijan, Madhu Maloti, Shonar Harin, Talalq, Shokal Shandhya and many more. He had never won any major award but his songs hummed by millions, was his greatest reward. His demise marks an irreparable loss to our cultural arena.